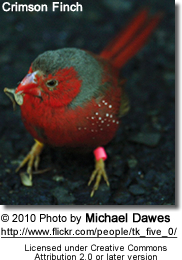 The Crimson Finch is a common species of estrildid finch found in Australia, Indonesia and Papua New Guinea. They inhabit the northern part of Australia, mainly in the Northern Territory. It is commonly found in moist savanna, and subtropical/ tropical (lowland) moist shrubland. The status of the species is evaluated as Least Concern. 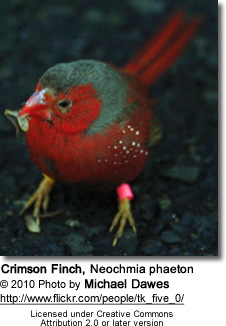 The Crimson finch (also known as the Blood Finch) has two distinct races, the Black-bellied and the White-bellied. The Black-bellied is the more common in captivity and therefore is reflected in its pricing. 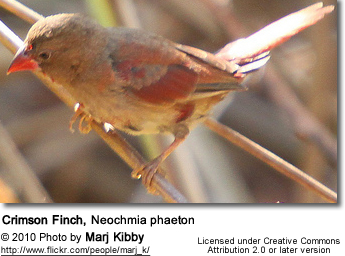 The Blood Finch is known by this name due to the predominantly blood red coloration of the plumage. This bird is often erroneously accused of being a "killer" in captivity. It is normally no more aggressive than any other Australian finch; only males kept as single birds for a long period of time eventually become aggressive.